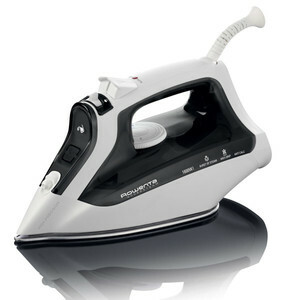 The DW2171 1600 Watt AccessSteam Iron by Rowenta is specially designed for ease and efficiency at the same time. This lightweight iron has microsteam stainless-steel soleplate with 300 microholes which allows perfect steam distribution. This 1600 Watt Iron having 8.45 oz water tank includes an anti-drip system to help prevent spitting or leaking at low heat settings, a self-clean system that flushes out loose mineral deposits for long-lasting performance and clean steam , and 3 way smart automatic shut off for safety—the iron turns off automatically if left unused after 8 minutes in the upright position, or after 30 seconds in the horizontal position or tipped over. • 8.45-oz. cap. water tank.